The information technology (IT) world has always experienced rapid changes, but the environment we are in today is bringing the broadest set of changes that the industry has ever seen. Every day more people are accessing more data from more sources and using more processing power than ever before. A profound consequence of this growing digital consumption is that the corporate data center is no longer the undisputed center of the computing universe. Cloud computing services are the incubators for new applications that are driving up the demand for data. IT managers are trying to understand what this means and how they are going to help their organizations keep up. It is abundantly clear that they need the ability to respond quickly, which means slow-moving infrastructures and management processes that were developed for data center-centric computing need to become more agile. Virtualization technologies that provide portability for operating systems and applications across hardware boundaries are enormously successful, but they are exposing the limitations of other data center designs, particularly constraints that hinder storage and data management at scale. It is inevitable that enterprise storage technologies will change to become more scalable, agile, and portable to reflect the changes to corporate computing. This book examines how storage and data management are being transformed by a hybrid cloud storage architecture that spans on-premises enterprise storage and cloud storage services to improve the management capabilities and efficiency of the organization. 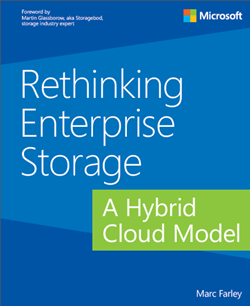 The Microsoft hybrid cloud storage (HCS) solution is an implementation of this architecture.